Jer.23:29 - Is not my word like as a fire? Saith the Lord; and like a hammer that breaketh the rock in pieces? and Jer.32:17 - Ah, Lord God! behold, thou hast made the heaven and the earth by thy great power and stretched out arm, and there is nothing to hard for thee: -I have seen these verses come alive in the states when I pastored, but here in a third world country with many additional barriers, it has really come alive, and I say to the Lord - “YES! YES!” in answer to both questions. Here is a story that shows The Mighty Word of God. Jerry, John and I along with many others went to the market on Saturday morning to hand out tracts and to hear a national (Jason) preach. Then after breakfast, we all headed for an hour walk to another village for visitation. Jerry and I paired up and went to a bush house to see one of Jerry’s relatives. 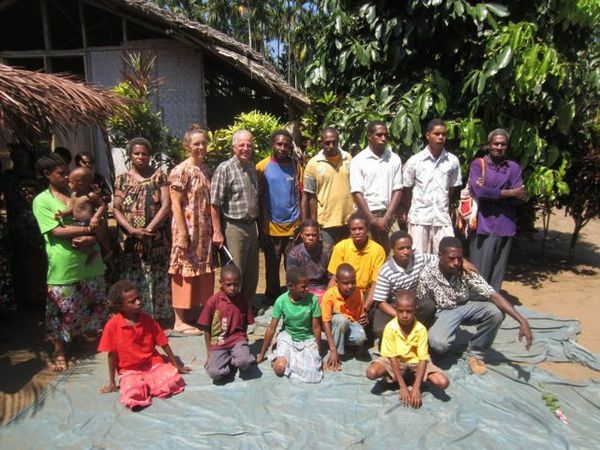 Kinships and relations are so important in PNG. 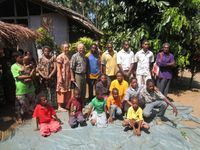 We would not even recognize or know our 52nd cousin, but here in PNG that 52nd cousin is close family in the tribe (clan) of that village. We were sitting on the veranda of their bush house. It is customary to take off shoes or sandals before entering the veranda or inside the house. The lady put a bowl of bananas in front of us to eat as we talked. Two grub worms remained on the floormat from breakfast, and I was sure any moment, they would be offered to Jerry and myself! At first there was just the woman and girl and then the man came around the house from working on some posts for an addition to his bush house. As he was coming around, (as we found out later in conversation) he said to himself that these men are my last hope. Wow! Faithfulness in visitation sure pays off with God. Might I add that it was very hot and very dry. For a rain forest on the coast, this area had become unusually dry and had gone without rain for a couple of months. All of their water was about to dry up. We were sweating the entire time we sat there. Jerry introduced us and explained in Orokolo (they only knew the heart language - Orokolo) why we were there and why I am in the Ihu district area. After formalities were over, Jerry asked me if I had any questions for them (an older couple and one teenage girl). I used their family relationship ties to bring up a question about God’s family and relationship ties. The man was sitting on the veranda when I started asking some questions. He started to open up and tell us that he got saved before but was under a couple of spells caused by the sorcerer in the village. One of those spells caused him to commit adultery; this he told us in front of his wife. He also had some very bad dreams which meant to him that he was going to die soon. I shared with him through Jerry some verses to show that the Holy Spirit and the evil spirit cannot dwell together in the same body. I found out that I could not cut through all the barriers by confronting his problem this directly. I had cultural barriers, language barriers, and spiritual barriers to overcome. He was without hope and in despair for his life. I told Jerry to ask him if we could just take him through the plan of salvation so he could make sure he was saved (I knew he was not). He agreed to let Jerry show him scripture and let the Holy Spirit walk him through God’s Word. I stopped everything and just said “Let me pray.” I asked the Lord to break all barriers and my ignorance and pierce through this man’s heart and save him for His Glory. “Would you, dear Lord, give us a token of what you want to do throughout Orokolo land?” Jerry then started and presented a very clear salvation through Romans and I John 5: and I started to watch The Mighty Word of God start piercing the man’s heart and the lady’s heart; even the girl’s heart. It was awesome to see the Holy Spirit at work and doing for them what we could not do. Jer. 23:29 was starting a fire and breaking rocks of culture, language and sorcery right away in front of us. Jerry finished and said, “Do you want to be saved?” and the old man said yes and then the lady said yes and they both prayed and trusted Jesus Christ as their Saviour. The man’s countenance just reversed to a great smile and his eyes lit right up with his wife’s. I turned to the girl and told Jerry to ask her if she wanted to be saved. She said she got saved before in Pastor Maisa’s church but she had strayed away in sin and wanted to reconcile with God. What a glorious time we had with these three Orokolo folk! I invited them to our services on Sunday and said I would be teaching Sunday School. I asked if they would be our guests. They said yes and it was simply awesome to see him show up in the men’s class that I was teaching. We hugged and hugged some more and it really encouraged the brethren that The Mighty Word of God does set a fire and break any rock of barriers that might exist. Sometimes our flesh sees all the barriers that seem impossible to break and the situation seems hopeless. It appears God can not possibly break that hard ol’ heart. Folks, He wants to do so much more!!! I am so excited to be living the dream that God has given us and that He has given us a token of two Orokolo souls to start a ministry - and I am not even living their yet! Hallelujah! What a Saviour!! The Mighty Word of God is just as powerful today as it has ever been or will be. We must trust that there really is nothing that is too hard for God. Yes, He is still even bigger than any sorcerer or any spell that could be cast!!! We use so many scripture cliches, but it really is true, that the One who dwells in me is greater than the one who dwells in the world.